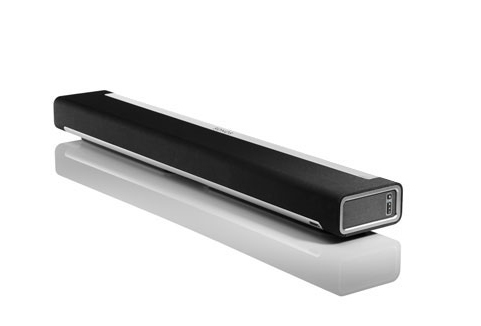 The nine-speaker design of SONOS PLAYBAR™ floods any room with super-realistic audio for games and movies. 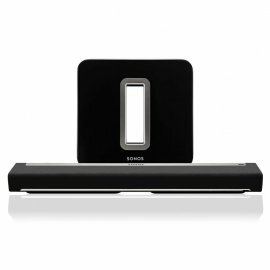 Connect PLAYBAR or BRIDGE to your wireless router and link all your SONOS players wirelessly with one touch. Sonos SUB Subwoofer in Black is the latest addition to the Sonos system and will take yours one large step closer to the spine- curling, jaw-dropping, full body experience music was meant to be! 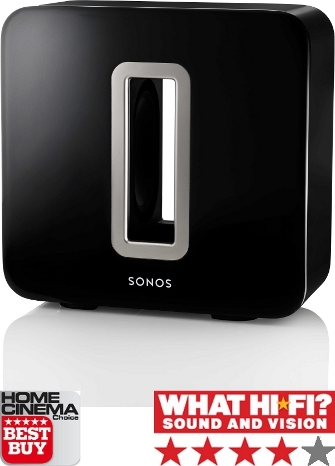 Setup is very easy and allows the SUB to work with all amplified Sonos products. Listen Down Deep - fills an entire room with thick layers of deep, bottomless sound that let you hear and feel every chord, kick, splash and roll. You won’t just hear the difference our wireless subwoofer makes - you’ll feel it in your bones. All Sound, Zero Vibration - two force-cancelling speakers positioned face-to-face means all the sound and energy from the music comes through loud and clear, and none of it is lost in cabinet buzz or rattle. One-Button Setup - no wiring. No programming. Press one button, follow the simple prompts on your Controller and the system automatically adjusts audio settings to perfectly balance your SUB and the paired Sonos component for a flawlessly optimized, whole-room listening experience. Wherever You Want It - because it’s wireless and designed to perform perfectly, whether positioned horizontally or vertically, you can put Sonos SUB anywhere you want in the room - even lying flat under a couch. Supported Devices - Sonos SUB works with all Sonos amplified components: CONNECT:AMP/ZP120/ZP100; PLAY:5/ZonePlayer S:5; PLAY:3. Does not work with the non-amplified Sonos CONNECT/ZP90/ZP80.